Sjogren's syndrome first described in 1933, consists of the triad of xerostomia, keratoconjunctivitis sicca, and in half to two thirds of patients, rheumatoid arthritis. The condition has been a subject of controversy pertaining to its diagnosis, etiopathogenesis, management and sequalae. Xerostomia, the oral component of this disorder is a cause of great discomfort. Three cases have been discussed in this article relevant to this condition. Multislice Spiral CT (Computed tomography) has become the modality of choice for evaluation of maxillofacial and mandibular pathologies in the recent years. The development of dental CT reformatting programs has completely revolutionized and changed the fashion to radiographically evaluate the jaw today. 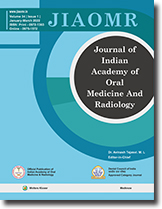 The study is based on the prospective evaluation of 60 patients with symptomatology related to mandible, using MDCT (Multidetector Computed Tomography) with its special Denta scan software and 3-D display techniques. The study aims at studying the imaging spectrum of various mandibular pathologies by MDCT to formulate a diagnosis and to assess the extent and involvement of adjacent structures thereby to substantiate the utility of MDCT in the management of these pathologies. P53 is a nuclear phosphoprotein encoded by the tumor suppressor gene p53. This P53 protein plays an important role in the regulation of normal cell proliferation by causing cell cycle arrest. Mutation of p53 gene produces an altered P53 protein leading to loss of cell cycle control. As a result, there is an uncontrolled cell proliferation, which may lead to the development of cancer. Mutation of the p53 gene is one of the commonest genetic changes in human cancers. This article reviews the basic structure, functions and the role of P53 in oral cancer. Oral Cancer is one of the most frequent malignant conditions affecting mankind today. Evidence in support of chemopreventive role for antioxidant nutrients like β-carotene and vitamin E are available in plenty. Antioxidants serve to stabilise the highly reactive free radicals thereby maintaining the structural and functional integrity of cells. Antioxidants status of the body can be considerably influenced by the diet. β-carotene is a pro-vitamin A and must be supplied through diet. Foods rich in, β-carotene have been found to reduce the risk of cancer It is a potent antioxidant because it works effectively even at low oxygen pressure found in living cells and tissues. An approach to the discovery and use of biomarkers for determining the efficacy of nutrient antioxidants as chemopreventive agents is to assess there ability to modulate their proposed mechanism of action in animal and small human clinical trials and then to link these actions to disease out comes and pathologic biomarkers. Keeping this in mind the present study was undertaken to evaluate serum-carotene level in oral cancer patients & to compare with the normal control group. Serum -carotene level was estimated by spectrophotometric method. The present study showed low levels of serum β-carotene in patients with oral carcinoma. Oral cancer, the sixth most common cancer worldwide remains, continues to be the most prevalent cancer related to the consumption of tobacco, alcohol and other carcinopenic products. Serum levels of circulating immune complexes, trace elements (copper, iron and selemium) were evaluated in 30 patients with OSMF (Oral submucous fibrosis)/leukoplakia, 30 patients with squrmous cell carcinoma and 30 normal subjects. There was a significant increase in the circulating immune complexes in the pre cancer and cancer patients. Serum copper levels showed gradual increase from pre cancer to cancer group. However, serum iron levels were decreaed significantly in the cancer group. Serum selenium levels were also decreased significantly in cancer group. Among, circulating immune complexes, serum copper, iron and selenium the best predictors for the occurrence of lesion were age, serum iron, circulating immune complexes and serum selenium in the decreasing order. Vascular lesions of the head and neck are common. Confusing terminology, lack of knowledge regarding lesion behavior and poorly understood diagnostic criteria often leads to improper diagnosis. Proper history, clinical examination and investigations help us to arrive at a correct diagnosis, which can considerably influence the treatment and its outcome. A case report with clinical and imaging findings of an extensive vascular malformation and treatment options for such vascular lesions is discussed. A 65 year old female reported with a chief complain of discoloration of palate since 8 months which was initially scattered and restricted to anterior palate; later on discoloration gradually spread over to involve the whole palate and buccolabial gingiva on right side. FNAC from lesion and submandibular lymph node revealed malignant melanoma. Malignant melanoma (MM) is a neoplasm of melanocytic origin that arises from a benign melanocytic lesion or de novo from melanocytes within otherwise normal mucosa or skin. It is one of most biologically unpredictable and deadly of all human neoplasms. It is third most common skin cancer, and accounts for 5% of all tumours. Although it comprises 1.3% of all cancers, MM of oral cavity accounts for only 0.2 to 8% of all reported melanomas. The mucosal melanoma tends to appear at a higher stage and is much aggressive than its cutaneous counterpart. The prognosis of oral melanoma is extremely poor, until recently less than 29% of affected patients survived for 5 years or more. Hemifacial Microsomia is a disorder characterised by the anomalies of the face, ears, eyes and the vertebrae. The incidence of this disorder is 1:3000 to 26, 000 and is usually seen at birth. It may be familial or sporadic cases. The disorder is more common in males especially on the right side of the face. The disorder was first identified by M. Goldenhar and J. Genet Hum in 1952, and was called Oculo-Auriculo-Vertebral dysplasia by R. J. Gorlin. Clinically one sees facial asymmetry, macrostomia, micrognathia, and microtia to anotia of the external ear, preauricular skin tags, and Epibulbar tumors in the eyes. One such case of Hemifacial Microsomia seen in a boyaged 9 years, who complained of facial asymmetry on the right side of the face since birth and an extra auricle on the same side, is reported here. The popliteal pterygium syndrome is a rare congenital disorder consisting of limb, genital and orofacial anomalies. This syndrome follows an autosomal dominant mode of inheritance with variable expression and incomplete penetrance.